The Student Portal is where students can take online assessments and view their test results. This document will review how students can review their assessment results, and access open education resources in the Student Portal. Please see the Help documents, Student Portal: Navigating the Launchpad and Student Portal: Taking an AKO or Item Bank Assessment, for more information. From the Top Menu Bar, select Scores (1a), then find the assessment results you wish to view by clicking on View Result (1b). 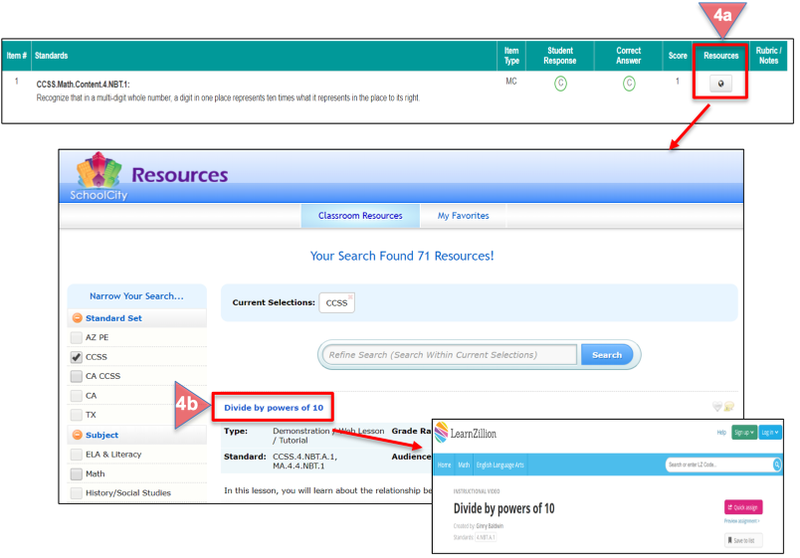 Or, click on the REVIEW SCORES Flip Card (1c), then click on the assessment name to review your scores (1d). Assessment name, Raw Score/Total Possible (Number of Points Earned/Total Number of Points Possible), Percent Correct, and Performance Level (if available). Tabs to select the desired view: All Items, Correct Items, Incorrect Items. Export this page to PDF. Once your teacher has scored your Constructed Response, your score will show in the Score column. You can view more details by clicking on the “CR” button in the Student Response column. It will turn orange. Your written response and any feedback from the teacher will appear directly below the item number and standard. Click on the Globe icon to view resources aligned to the standards for a particular item. Your teacher may assign activities or lessons to individual students, student groups, or to all students as a way to revisit the concepts covered by the item. Click on the title of the resource (in blue font) you have been assigned to start the lesson. (CR) Constructed Response: Requires a written response from the student and is scored with a rubric. (EBSR) Evidence Based Selected Response: Requires the student to answer a two-part question in which Part B provides text evidence for the answer in Part A. Generally, Part A is a Multiple Choice or Multiple Response question, while Part B can be Multiple Choice, Multiple Response, or Hot Text. No partial credit. (XCR) Explicit Constructed Response: Requires the student to enter an exact response to a question. (GM) Gap Match or (GGM) Graphic Gap Match: Requires the student to click and drag image, words, phrases, or numbers into or next to the correct response box. (GL) Graphing Lines: Requires the student to draw up to 9 line segments on a graph. No partial credit. (GP) Graphing Points: Requires the student to plot up to 9 points on a graph. No partial credit. (HS) Hot Spot: Requires the student to select the correct answer by clicking on it. (HT) Hot Text: Requires the student to select underlined words, phrases, or sentences within a given text to answer the question. No partial credit. (IC) Inline Choice: Requires the student to select the correct answer from a drop down menu. (MT) Matching Table: Requires the student to select a checkbox in a table to match or answer the question in the problem. Options may be Yes/No, Does Support/Does Not Support, True/False, or another choice of two or more options. No partial credit. (MB) Multiple Binary: Requires the student to indicate if up to six answer choices are Yes/No, True/False, or Correct/Incorrect. No partial credit. (MC) Multiple Choice: Requires the student to select one correct answer from up to nine answer choices. (MR) Multiple Response: Requires the student to select two or more correct answers from up to nine answer choices. May allow partial credit depending on source of item. (NL) Number Line: Requires the student to place a point or points on a number line where a number or numbers should be located. No partial credit. (NLDP) Number Line Dot Plot: Requires the student to complete a line plot that displays the data as directed. No partial credit. (NR) Numerical Response: Requires the student to type the answer to a numeric problem on a keypad. (OI) Order Items: Requires the student to drag and drop answer choices into the correct order. Answers are automatically scored by the system. No partial credit. (SA) Short Answer: Requires the student to enter an answer to a question similar to “fill in the blank”. There is only one correct answer.